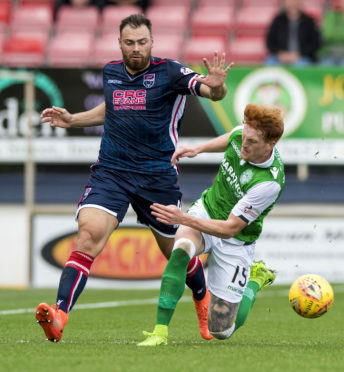 Dutch defender Kenny van der Weg says returning to Ross County on an 18-month contract feels like the perfect homecoming. Van der Weg finalised his return to Victoria Park on Thursday, after ending a six-month stint with Belgian second-tier side KSV Roeselare last month. It comes just 12 months after the 27-year-old left the Staggies to join Hamilton Accies during Owen Coyle’s tenure in charge. Should he receive international clearance in time, van der Weg could feature in today’s Championship trip to Queen of the South, and the left-sided player says his familiarity with the Dingwall club made it an easy decision to re-sign. Van der Weg said: “I was playing in Belgium, but I wanted to make sure I was coming to a place where I knew. “When Ross County came it was easy to make a decision, and that was important for the move. “I want to enjoy football again. I know the place and I know the club. For me, at this moment, that was very important. “It’s my second time at the club. I like the way the people here work, and I know everything here. It’s feels a little bit like coming home. Although van der Weg does not reflect fondly on his time in Belgium, where he made just six appearances for Roeselare, he insists he has no regrets over opting to try his luck in a different country, adding: “I can’t say too much about my experience in Belgium because I don’t think it’s really fair, but I wasn’t enjoying it. “I don’t say it was a big mistake to go there, but with every choice you make, you learn something. “You play different football and have a different lifestyle, and I think it made me a better person. I grew up more. “But Scotland is more for me, and a better country to play in. I feel comfortable in Scotland and that’s why I wanted to come back. Although County were in the Premiership throughout van der Weg’s 59 previous appearances for the club, the former NAC Breda player is determined to help lead Steven Ferguson and Stuart Kettlewell’s men back to the top-flight, with the Highlanders currently three points clear at the top. He added: “If I didn’t like this league, I wouldn’t have come here. That’s how it works. “Ross County have a good team that is playing for the league, and that’s important for a player. “Now I’m playing for a club that’s trying to come up, and trying to win trophies. That’s what a player wants. “Sometimes you can stay in the Premiership and choose a team that’s playing to avoid relegation, or you can start over and grow in a team.